Are you currently a Chinese teacher? Or do you want to become one? 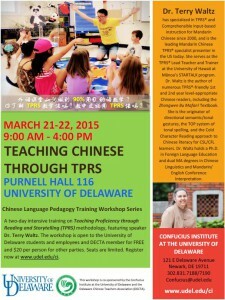 The Confucius Institute at the University of Delaware and the Delaware Chinese Teachers Association (DECTA) present a Chinese Language Pedagogy Training Workshop, featuring “Teaching Chinese Through TPRS” with Dr. Terry Waltz. Dr. Waltz has specialized in TPRS and Comprehensible Input-based instruction for Mandarin Chinese since 2000, and is the leading Mandarin Chinese TPRS specialist presenter in the US today. She serves as the TPRS Lead Teacher and Trainer at the University of Hawaii at Mānoa’s STARTALK program. Dr. Waltz is the author numerous TPRS-friendly 1st and 2nd year level-appropriate Chinese readers, including the Zhongwen Bu Mafan! Textbook. She is the originator of directional semantic/tonal gestures, the TOP system of tonal spelling, and the Cold Character Reading approach to Chinese literacy for CSL/CFL learners. Dr. Waltz holds a Ph.D. in Foreign Language Education and dual MA degrees in Chinese Linguistics and Mandarin/English Conference Interpretation. Direction and parking instruction to Purnell Hall can be found here. The workshop is open to the University of Delaware students and employees and DECTA member for FREE and $20 per person for other parties. Workshop certificate will be issued. Seats are limited. Register now below.